My curiosity drives my inspiration. Abstract scientific concepts in physics, biology and chemistry, along with the pure fun of exploring what paint can do, keep me exploring. My love of and fascination with the materials for making art have pushed me to expand the paintings beyond the flat surface. I have adapted my paintings into three dimensional sculptures which incorporate layers of acrylic paint onto cast acrylic. The pieces are fused together like glass but using resin. Light moves through them and they have multiple images depending on the angle of viewing. I will often insert these layered pieces into the wood panels that I paint on. The look is intriguing and will pull the viewer into the depth of the layers. I call them layers of light and color. 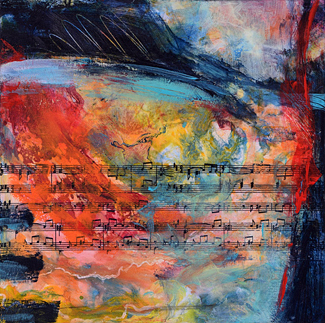 Synesthesia plays a role in the color and composition, because when I hear music I see colors. 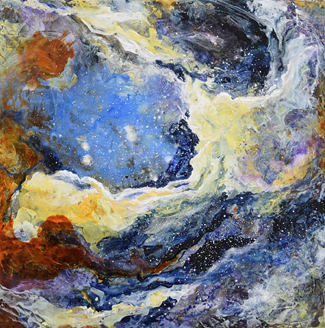 Sandra Duran Wilson is a scientist and an artist. She also has synesthesia, a crossing of the senses. Her colorful, vibrant work blends music into colors. She has shown her work internationally, including several successful exhibitions in Australia, and her work is in numerous state collections, including four in New Mexico. She is represented in galleries in the US and Australia, and her work is included in many corporate, educational and private collections worldwide. She is the author of six art technique books and teaches internationally and online as well. She grew up on the border of Mexico and began apprenticing under her great aunt Santa Duran. Her scientific studies directed her work from realism to abstraction. The work is influenced by theoretical scientific concepts in physics, biology and chemistry. She has degrees in both Fine Art and Cognitive Science from UNM and has lived in Santa Fe since 1977.